Thank you to everyone who came out to Sundaes on Sunday, The Rodef Shalom Ice Cream Social! Without you, this event wouldn’t have been successful! Check out photos on Rodef Shalom’s Facebook Page! 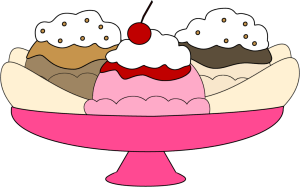 This year’s Sundaes on Sunday was held on Sunday, April 27th from 4:00-6:30 p.m. at Klavon’s Ice Cream in the Strip! A DELICIOUS limited menu was available which included ice cream cones, sundaes, paninis, grilled cheeses, hot dogs, and drinks. Rodef’s own celebrity scoopers scooped your ice cream! A portion of the benefited the Rodef Shalom’s Family Center! Prior to the Ice Cream Social, we had a SPECIAL CONTEST for children asking them to draw their FAVORITE sundae and name the Rodef Shalom Special Sundae. The Special Sunday was named Sun Dream and was made up of Cookie Dough Ice Cream, M&Ms, Hot Fudge, Whipped Cream, Sprinkles, & A Cherry on Top! The winner was Elena Lux! Congratulations!